Bonjour, bienvenue à la nourriture de ce mois-ci du monde, la France! 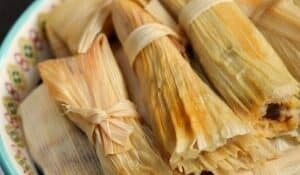 Hello, welcome to this month’s Food of the World – France! Let me just start by saying, this Chicken au Champagne is going to blow your mind!! The flavors are absolutely amazing. I am not a Champagne lover, I actually can’t stand the taste of it. When combined with chicken, and tarragon, il est magnifique! How crazy is it, that I used a cast iron skillet to make a meal with Champagne? It worked perfectly, and adds a nice rustic touch to this gourmet meal. Oh yes, this is a restaurant quality meal that you can surely impress your dinner guests with! 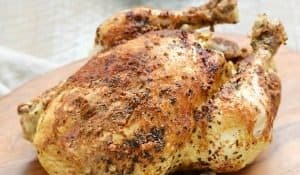 How do you make Chicken au Champagne? Preheat oven to 375 degrees. Heat 1 Tablespoon of olive oil in a large skillet. Seer the chicken, about three minutes on each side….. 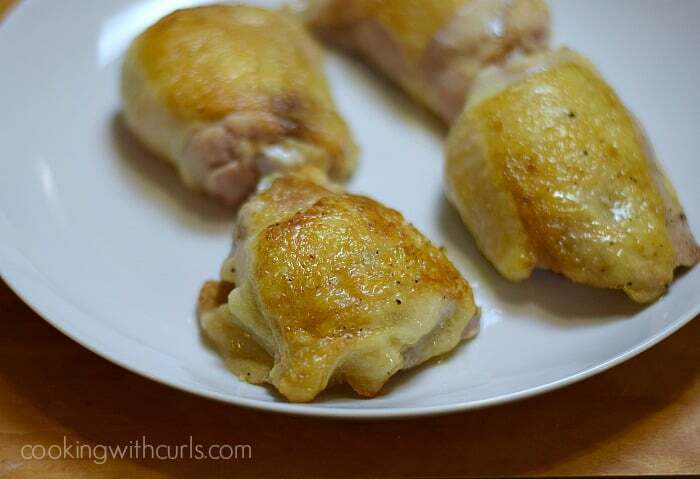 Remove chicken, and place on a plate…..
Have the champagne ready to go BEFORE you add the shallots. They cook very quickly! Add the champagne…..
My shallots got a bit too brown, but don’t worry, it didn’t ruin the dish. 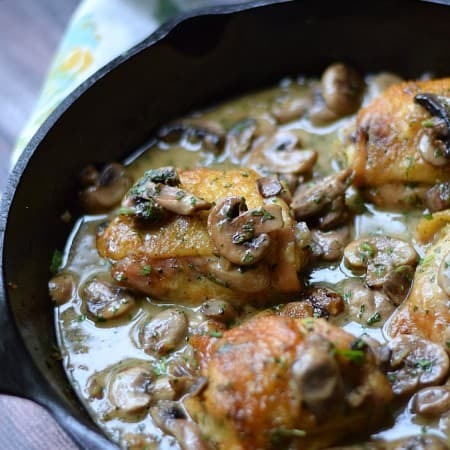 😉 Scrape the bottom of the pan to remove the cooked bits, and add the chicken back to the pan…..
Baste chicken with the sauce and place in preheated oven and bake for 25 minutes, until thoroughly cooked. 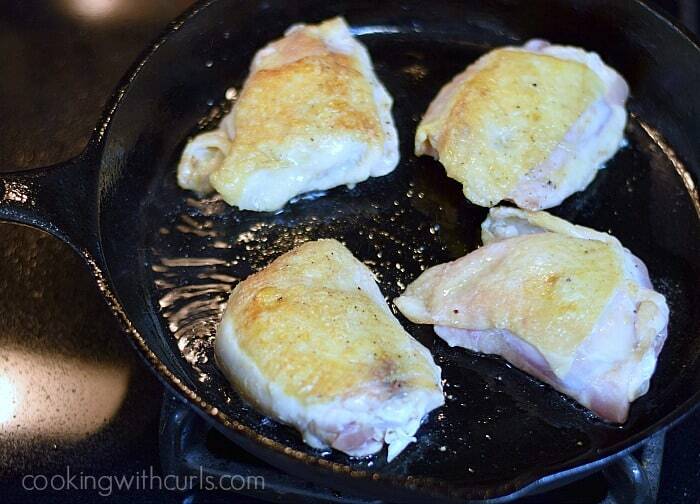 While the chicken is baking, heat butter in a non-stick pan. 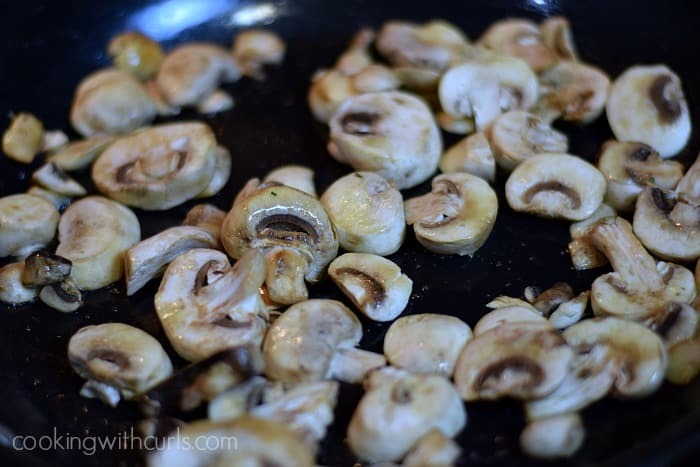 Add the mushrooms and cook for 5 minutes….. 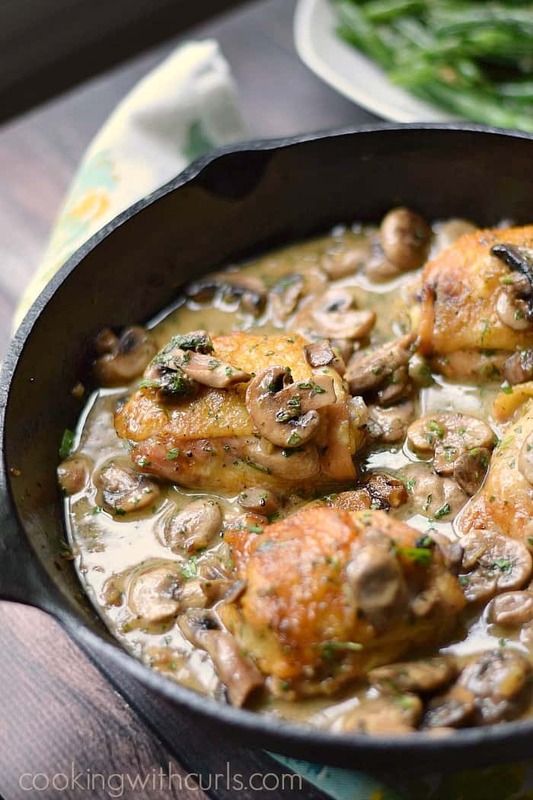 Remove chicken from oven, and add the mushrooms and tarragon to the skillet…..
Gently stir to combine and drizzle with fresh lemon juice. 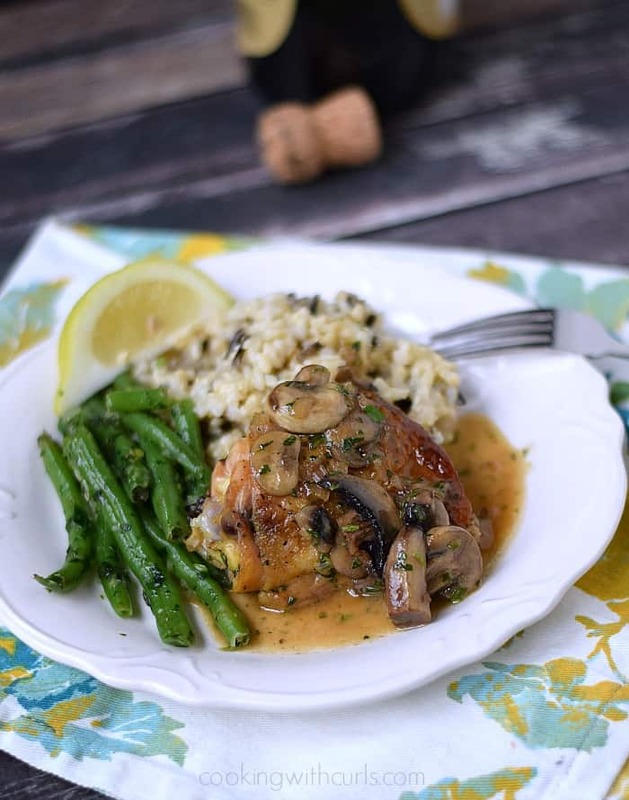 Serve with brown rice and Hericot Vert (French green beans)…..
Pour sauce over the chicken and oooh, la la!! *Disclaimer* I did not use French Champagne – blasphème! I just could not wrap my head around the thought of using a $60 bottle of Veuve Clicquot, in a main dish. That is a champagne to savor and enjoy! I used Korbel Brut, at $14 a bottle it is a much better choice. Sorry, there is no substitute for the champagne in in this dish. Here are some additional skillet meals you will love! 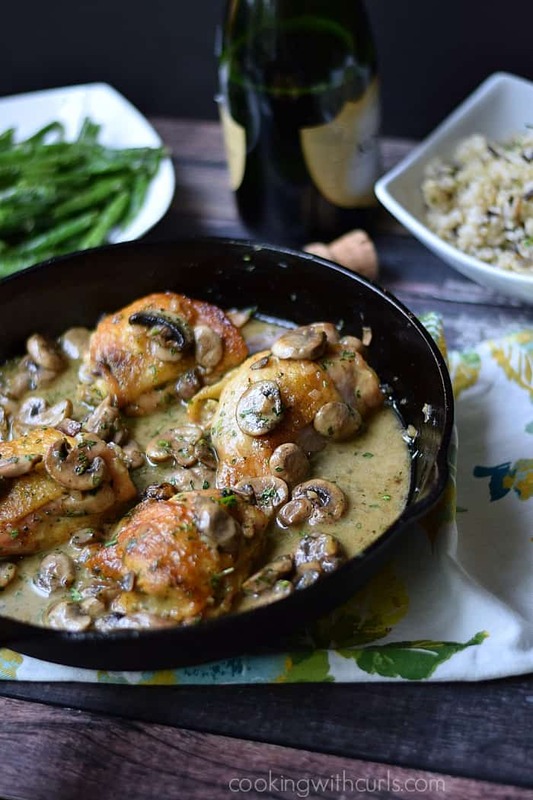 This rustic, yet elegant Chicken au Champagne is sure to please everyone around the dinner table! It's perfect for date night or a casual weeknight meal. Preheat oven to 375 degrees. 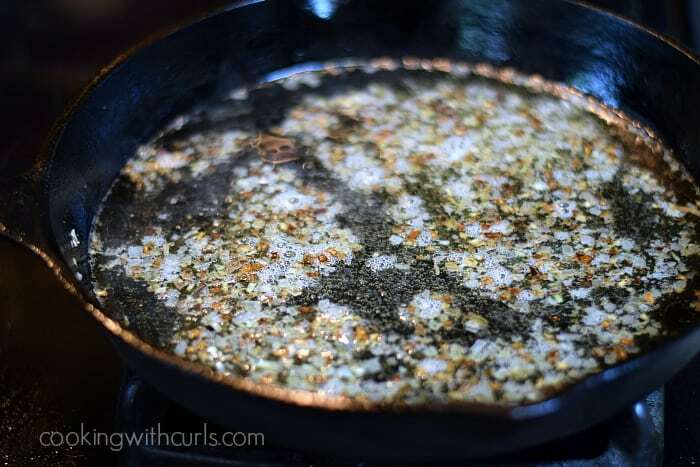 Heat olive oil in a large skillet. Add chicken to skillet and seer for 3 minutes on each side. Remove chicken, and place on a plate. 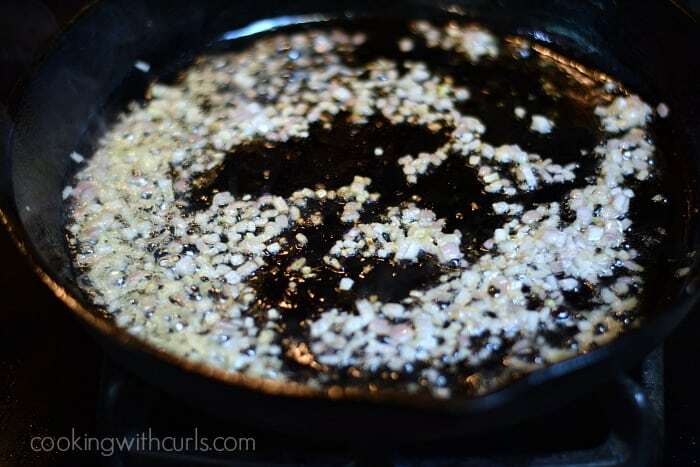 Remove pan from heat, and add shallots. Heat and stir for 1 minute. Add the Champagne and scrape bottom of pan to remove all of the cooked bits. Place the chicken back in the pan, baste with the champagne sauce and place in the oven. Bake for 25 to 30 minutes until thoroughly cooked. Heat butter in a large non-stick pan. Add the mushrooms and cook for 5 minutes. 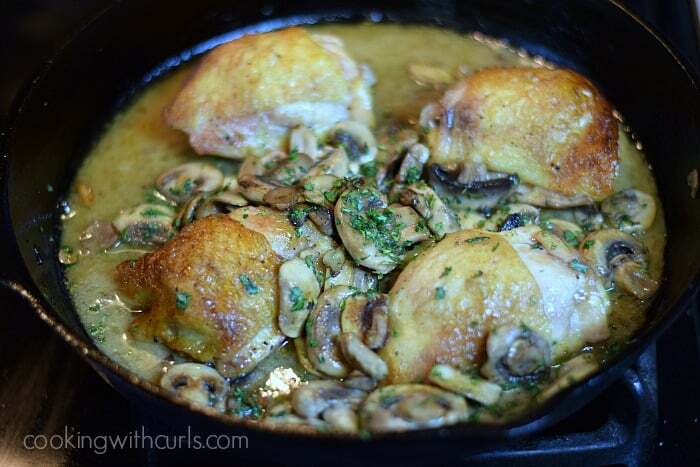 Remove chicken from oven, and add the sauteed mushrooms. Stir in the tarragon and drizzle with lemon juice. Serve with brown rice and Haricot Vert (French green beans). This dish would traditionally be made with skin on, bone in, chicken breasts, but those can be difficult to find. I used chicken thighs, and probably always will. ? 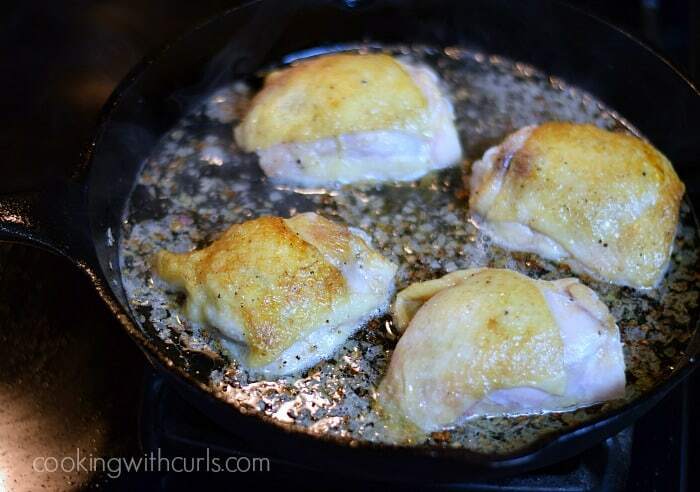 If chicken thighs are small, you can easily fit 6 in the pan. Made this for dinner tonight. 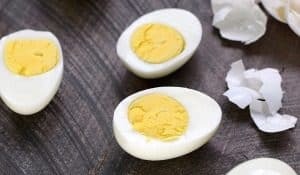 Quick, easy, and DIVINE! Quick for a weeknight dinner, but “fancy” enough for a dinner party! Love it, thanks! This was amazing!!! Wow what flavor and so easy! Thank you. This recipe looks great and I don’t anticipate having a problem using the extra bubbly! I never made this wonderful recipe and I have a lot of sparkling wine from a promotion… can’t wait to check it out. Hope all is well with you. French advise : You can also try this receipe with 1/2 cup of cognac instead of champagne and add a little bit of french cream at the end … It taste a little bit different but it is also fabulous… and no need to open a bottle of champagne just to cook. So I made this tonight for my hubby and my dad. I served with green beans and potatoes. I feel it needs some kind of starch because it’s hard to imagine the chicken and sauce without it. This dish was yummy and made me feel like I was in a fancy traditional French restaurant. And it was boy approved! I also live in New orleans so if you want more of that creole french feel, this isn’t it. But if you want more of that yummy traditional flavor from the shallots and champagne, this is sure to hit the spot. Great job on the recipe! This was fantastic, and easy, thanks! We had it over mashed potatoes. I added too much oil to the pan for fear of sticking and it may have prevented some of the browning, so I’ll use less in the future. I don’t cook with tarragon much, but this is going to be added to the regular rotation. The leftover champagne is just a bonus. I am going to try growing tarragon!